St. Paul’s University College is hosting the 2018 Stanley Knowles Humanitarian Service Lecture. 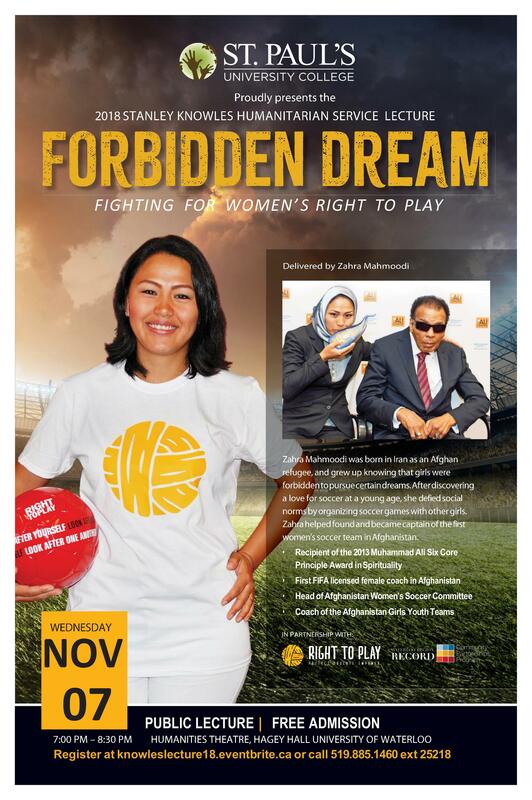 This year’s speaker is Zahra Mahmoodi, former captain of the Afghanistan national women’s soccer team, is presenting Forbidden Dream: Fighting for Women’s Right to Play. We are expecting a great turnout of students/faculty and local community members interested in the intersection of sports, philanthropy, gender equality and international development. The lecture is put on in partnership with with Right to Play and the Waterloo Region Record Community Partnership Program and St. Paul’s University College, and is happening Wednesday, November 7, 2018 at the Humanities Theatre, University of Waterloo. Zahra will be talking about women’s and girl’s rights, and how she had to stand up for what she knew was right even when she was told her actions were wrong.